Some of the Blackhawks seemed a little testy after their United Center workout Tuesday. Maybe it had something to do with going to Detroit. Or maybe they were tired of answering questions about the mighty Red Wings. Kris Versteeg, who was whistled for three penalties in their crushing 6-1 loss Sunday, bristled at the suggestion that the Hawks were riled up in Game 4 because of the hit that left Martin Havlat woozy in Game 3 on Friday night. 2.14 Goals-against average of Red Wings goalie Chris Osgood, second-best in the playoffs. He has allowed more than two goals once in the finals. +4 Team-leading plus-minus rating in the playoffs for Blackhawks Adam Burish and Andrew Ladd. Patrick Kane is a team-worst minus-10. 275 Blackhawks penalty minutes in the playoffs, a league high. Their 17.4-minute average per game ranks fourth. ''[The penalties] had nothing to do with prior games,'' the rookie winger said. What might be gnawing at them is that in a brief stretch at the end of the first period and the start of the second, they went from down 1-0 and lurking to down 4-1 and gasping. It wasn't just a game -- their season is on the brink. A soft goal here, the worst penalty call in the history of sports there -- and any chance the Hawks had of evening the series at 2-2 evaporated. They know their chances of winning this series are now a long shot. They know everyone thinks they're running on fumes and expects a loss that would bring a loud silence to what has been an exciting and rewarding season in Chicago. The only thing left for the Hawks is the 9 percent solution. And even that is on the back burner. In NHL history, teams have trailed 3-1 in a best-of-seven series 233 times. Only 21 of those teams have come back to win the series. That's 9 percent. It's not an encouraging number. Toews also pointed to the Hawks' competitiveness in the first two games in Detroit. In a strange kind of way, the Hawks can play looser tonight than they did Sunday at the UC. In Game 4, they were intent on using their home ice to even the series at 2-2. Having failed, they can go out and play like there's no tomorrow. Because there isn't one. With goalie Nikolai Khabibulin unlikely to play and star winger Martin Havlat unlikely to be himself, the Hawks have fewer hands to paddle out of the muck. All they're thinking about, though, is stealing a game. That's what they have to say. That's what they have to believe. But 9 percent is not a number to hang your playoff hopes on. ...and who knows...so may the Red Wings. Everything is on the line tonight. Finally was able to work a Headstone's song in to a thread! NOTE: My avatar is Hugh Dillon... lead singer for The Headstones. I think Chicago can pull this one out. They want to give their fans one more game. Plus Detroit may still be without Datsyuk and Lidstrom. They need them healthy for the Finals. Hawks need three in a row to win, so it's a little bit like a 3 goal lead late in the third. Let your top line rest up for the next game, rather than risk injury. wprager wrote: Let your top line rest up for the next game, rather than risk injury. Interesting strategy there... and not one I'd subscribe to. I've always been of the opinion that you take your opposition out at the earliest given chance and don't risk giving them any slack to gain any type of momentum. And isn't there a game left to be played? Entering a playoff game in the third period to relieve an injured starter is something Blackhawks goaltender Cristobal Huet had coyly said he didn't recommend. Losing a playoff game 6-1, giving up five goals and setting up a possible elimination game, probably wasn't on Huet's must-do list either. "Every time you can learn from what you've done," Huet said of his Game 4 performance against the Detroit Red Wings, who took a 3-1 series lead Sunday. "There's certainly a lot of things I would like to improve on to get my game back. There is no room for error." Nikolai Khabibulin, who started throughout the playoffs until leaving Game 3 with a lower-body injury, did not practice on Tuesday. Coach Joel Quenneville did not rule out that Khabibulin would play Wednesday night, but Huet appears to be the goaltender most likely in charge of helping the Hawks avoid elimination in Game 5 of the Western Conference finals. "[It's] going to be a game where we have to fight for our life," Huet said. "We have to get better, myself first." Quenneville said he would see if Khabibulin could skate in the morning before the game at Joe Louis Arena, but he expects Huet to rebound. "You've got to bounce forward and look at the next opportunity," Quenneville said. "We expect if he plays, he'll be fine." While sharing goaltending responsibilities with Khabibulin this season, Huet went 20-15-4. Quenneville points to Huet's last regular season game, a 4-2 win at Detroit in which he made 21 saves. The Hawks would like to think of Sunday's loss as an aberration for Huet. He allowed five or more goals three times during the regular season, including six goals in a 6-4 loss to Detroit on Jan. 1. 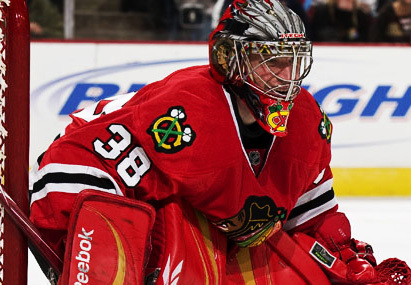 But during an eight-game Hawks' winning streak in December, Huet contributed five wins, allowing only four goals. One of his more memorable outings came in November, when he stopped 48 of 51 shots by Columbus in a victory. But if he starts on Wednesday and doesn't come up with a different result than the one in Game 4, that wreckage might be the lasting memory until next season -- for Huet and the Blackhawks. "We're confident we can win," Huet said, "and that's going to be our mind-set." Here's an interesting thing. In order for Detroit to win tonight they would probably push Datsyuk and Lidstrom into action. Not that they can't win without those two, but with Chicago itching for one more game at home, I believe the Wings need Lidstrom, not Chelios, in the lineup. So, if they win tonight, then the Finals start on Saturday (assuming that the NHL implements the schedule changes they've been talking about). That would give them just three days to rest up, to the Pens' four days. 4 days is not enough to generate rust, and their top players could still be, possibly, playing hurt. On the other hand, if they rest Datsyuk and Lidstrom, they still have two more kicks at the can on Saturday and Monday, with at least one extra day rest before the Finals (if they win Monday, then play the opener Friday as per the original schedule). And the Penguins will then have been sitting idle for *10* days! That's a lot of rust. Or they win Saturday and get 6 days' rest -- lots of time for nagging injuries to heal, not enough to get as rusty as the Pens. Or they stil win tonoight without Datsyuk and Lidstrom, giving their top guys and extra four no-activity days to nurse their injuries. No matter how I look at it, it makes a hell of a lot of sense for the Wings to sit Datsyuk and Lidstrom. 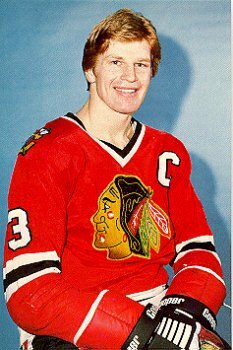 If the Blackhawks don't pull off a minor miracle Wednesday and come back from a 3-1 hole in the Western Conference finals, the memory of their Game 4 loss will be hard to shake. Chicago players will look back and realize they lost control. That won't be the worst thing to happen if that experience can be used as a building block for the future. I thought the young legs of the Hawks could make a difference in the series. Although they have age on their side, the lack of playoff experience has haunted them. The Wings are showing they can't be rattled, and they stay determined no matter who is out of their lineup. It sounds trite, but the Red Wings have seen this all before and have the depth to overcome obstacles. Playing catch-up takes a lot of energy out of a team, and the Blackhawks have been playing from behind for almost the entire playoffs. Against lesser opponents, the Hawks' skill and determination resulted in victories. But the story has been very different against the champs. Red Wings head coach Mike Babc0ck said while teams need skill to win in the postseason, it is more about will, determination and execution. The Red Wings have muted the Blackhawks' skill. And the Hawks' will, determination and execution have not produced positive results. Martin Havlat: two assists, five shots. Jonathan Toews: three goals, 11 shots. Patrick Kane: one assist, five shots. Kris Versteeg: one goal, one assist, nine shots. Patrick Sharp: two goals, 10 shots. Dave Bolland: two assists, five shots. Chicago has been outscored 17-9 in the series, so it is no surprise that all those players have a negative plus-minus rating. Kane not only has been held to one assist, but he is also a minus-7 in the series. Except for Toews, no forward mentioned has been effective. Besides not scoring, Kane and Versteeg also have had trouble with turnovers. In the Detroit series, no forward has appeared more out of place at times than Kane. His performance Sunday was particularly disappointing because his shadow in the series, Nicklas Lidstrom, was out of the lineup. It didn't help Kane as he managed only one shot on goal and was guilty of three give-aways. His minus-2 rating in Sunday's contest might indicate Kane's gas tank is almost empty. It takes a lot of energy to back check and play good defense, and Kane will have to get recharged for Game 5. Detroit needs to be credited for shutting down the Hawks' leading scorers. The Blackhawks seem to be the more fatigued club. Give the Red Wings credit as they have made the Hawks work hard for every inch of ice. The emotional roller-coaster ride of the past few weeks must also be draining the Hawks of their energy. Joel Quenneville saw his team play its worst game of the playoffs Sunday, but he didn't throw the players under the bus in front of the media. He directed his disenchantment at the officiating. But make no mistake, he realizes his group needs to quickly get better. For the Hawks to be able to force a Game 6, they'll need renewed will and determination, which might lead to better execution. Quenneville was fined Monday, but he probably isn't very focused on the $10,000 penalty imposed by the NHL. I can't fault the NHL for imposing the fine, but the usually cool and well-measured Quenneville did get his money's worth. "I think we witnessed probably the worst call in the history of sports there," Quenneville said after the game. "Nothing play. They scored, it's 3-0. They ruined a good hockey game and absolutely destroyed what was going on the ice. … Never seen anything like it." Not the best of days for the Blackhawks, or their bench boss. Quenneville usually has been able to get his team to respond. His young and rambunctious group hardly ever has played two poor periods in a row all season. Unfortunately for his crew, that was not the case in Game 4. Same set of walking wounded from the last game... could be a repeat of Game 4.